Once again, it's industry day. 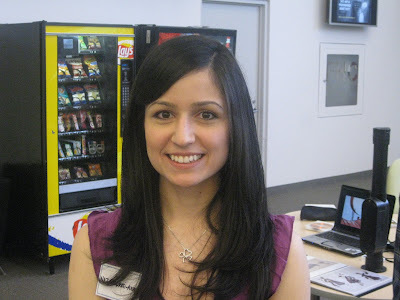 The work of graduating students is screened for people who are looking for talent. Below is a collection of photos from today. 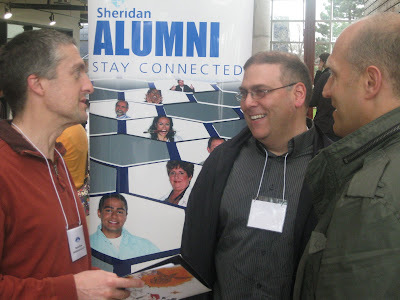 Robin King, founder of Sheridan's cgi program and currently a consultant. 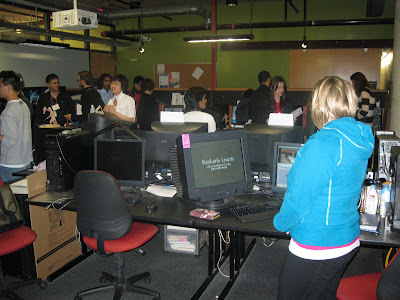 Students and guests inside the cgi lab. Frank Macchia (left) and Mark Sperber prepare to receive the industry. 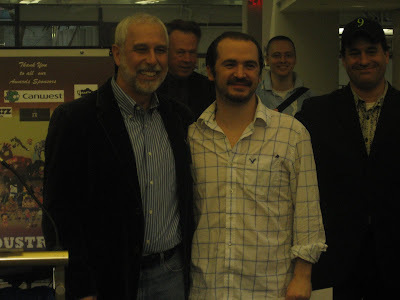 Left to right: Animator Stephen Barnes, John Mariella of CORE and independent producer Doug Masters. 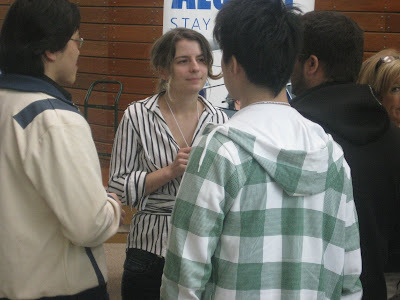 Sheridan alumnus Marceline Gagnon-tanguay, currently at Blue Sky. 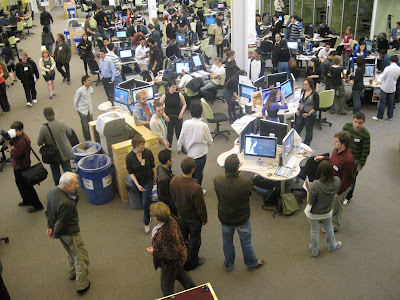 Two aerial views of the learning commons, where the students met the industry. 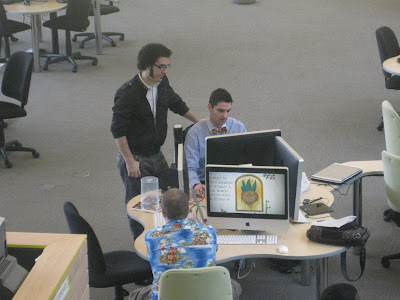 Three excellent animators I've had the pleasure of teaching. 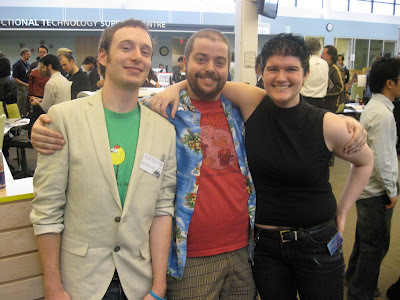 From left to right: Jason Teeuwisson, Brock Gallagher and Kelly Turnbull. Naz Ghodrati-azadi's film is called Gobbled. 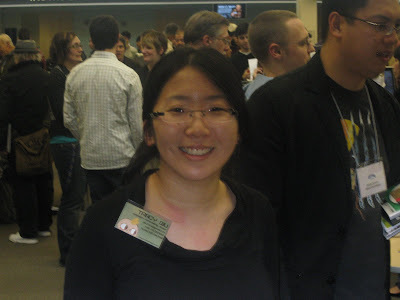 She'll be moving to Los Angeles this summer, so west coast studios should keep an eye out for this talented animator. Tapan Gandhi's film is called The Ballad of Amelia von Earl. Tracy Qiu's film is called Lobster Boy. 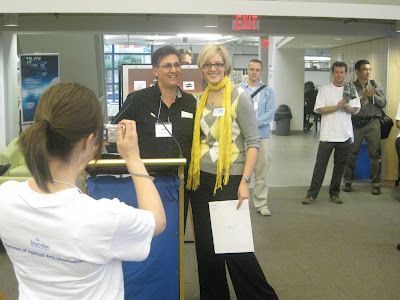 Industry Day coordinator Tony Tarantini presents an award to Kayla McIlwaine for her film A Princess Story. Mark Simon (left), coordinator of the post-graduate cgi program, presents an award to Inigo Ahedo for his film Smores. A panel of industry professionals giving advice to the students. 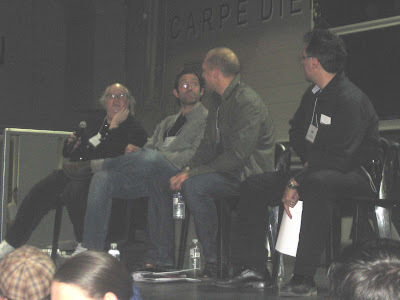 From left: Tom Knott (formerly of Laika, Warner Bros. and the Ottawa Animation Festival), Evan Spiridellis of JibJab, Doug Masters (formerly with CORE and currently an independent producer) and industry day coordinator Tony Tarantini. What's above is only a fraction of what transpired. 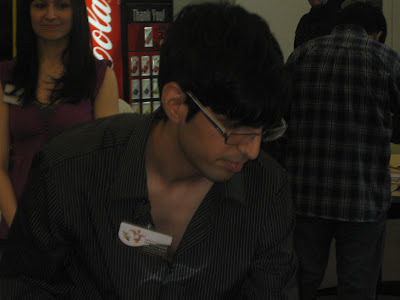 More than 4 hours of student films were screened. I will be screening a selection of this year's films at the Bloor Cinema in Toronto on Tuesday, June 9 at 7 p.m. and again on Wednesday June 10 at 9:30. Admission will be $5 and it's open to the public. I'll post more about this screening as it approaches. 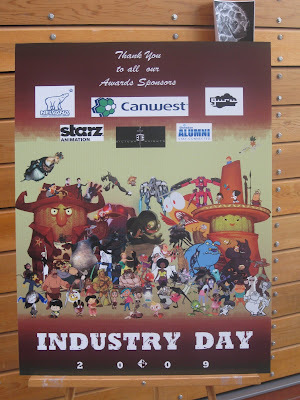 If you were at industry day and have any thoughts about the films or the days events, please leave a comment. "At the heart of creativity is a willingness to take risks, a willingness to experiment, a willingness to explore avenues that don't go anywhere and a willingness to be wrong. And if you're living in a culture of standardized testing, high-stakes funding, where mistakes are not tolerated and seen as a sign of mental infirmity, then you're breeding a contradiction right at the heart of the system." "The real innovation and creativity always comes from people crossing borders, crossing boundaries, thinking differently and very often through the interaction of disciplines through applying ideas from one field into another field. The real vitality of intelligence and creative thinking is in making connections, not from keeping everything separate." The above quotes come from an interview with Sir Ken Robinson in The Globe and Mail. 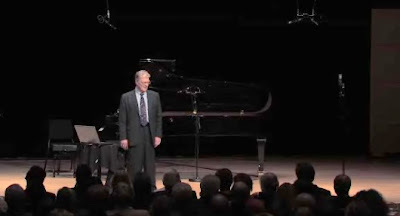 I first became aware of Sir Ken Robinson from the TED video that is embedded below. The Globe and Mail has a pair of videos that I can't embed, but you can find them here and here. Robinson comes off as much as a stand-up comedian as someone interested in reforming education. While he is entertaining to watch, he also has important things to say about arts education and those things also apply to the animation industry. The first quote above speaks directly to our need to fail faster and cheaper. As it is impossible to succeed every time, failure must be tolerated as the price of innovation. As failure is inevitable, the faster and more cheaply we can fail, the more quickly we can find out what works and we'll have more resources left to support it. The second quote is not only true of education, it is also true of animation production. Thanks to J.R. Bray and Walt Disney, the animation business was built to resemble a Ford assembly line. Bray was satisfied with being the Model T of animation, but Disney himself was able to make connections between his various departments. Because he valued innovation, the various departments competed to impress him. He was blessed with a steady stream of new ideas and techniques during the 1930's and he chose what suited his vision. As good as Disney's results were, I don't think the system was perfect and without someone of Disney's calibre at the top, the product drifts back towards the Model T. Certainly that's the case in TV animation. The need to cross boundaries is made more difficult by outsourcing, where there are economic and geographic walls between departments. Not everyone is equally good at everything. We naturally fall into specialization. 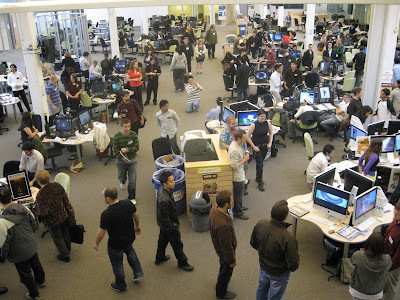 But when the system limits collaboration and feedback, we are throwing away opportunities. It's taken me a while to get to Stepping Into the Picture: Cartoon Designer Maurice Noble by Robert J. McKinnon. It is slightly less than one third of a good book and I'll explain what I mean. What's here is a fairly straightforward biography of Maurice Noble, the designer whose most well-known work was for the Chuck Jones unit at Warner Bros. The book is drawn from interviews with Noble and his co-workers and to the extent that it fills in the details of Noble's life, it is mostly good. It covers Noble's childhood, education and professional jobs, including Disney, Warner Bros, John Sutherland Productions and MGM, in addition to providing details about Noble's personal life. The information about the physical set-up of Warner Bros. and the personal dynamics of the Jones unit are the best things in the book. However, the writing sometimes stumbles. There is a story about architectural drawings done by Noble while a student at Chouinard. The drawings vanished and the book initially suggests that they were sold and used in the design of Radio City Music Hall before backpedaling to say that "the likelihood that the designer of Radio City, Donald Deskey, was in any way influenced by Maurice's designs was highly improbable" [italics in original]. If that is the case, why suggest otherwise? This brings me to the missing two thirds of the book. While there are several pages of colour reproductions, the size and format of this book don't allow for Noble's work to be shown at its best. A biography of a designer that barely reproduces his designs is inadequate. The other third missing is evaluation and analysis. As the first biography of Maurice Noble, it is the author's obligation to make a case for Noble's work. While animation professionals and fans will know Noble's name, those unfamiliar with the films need to know why Noble is worthy of attention. 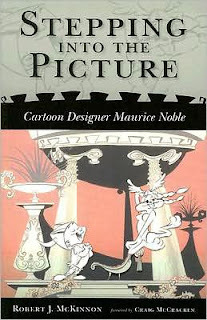 While McKinnon quotes Noble on his design approach, there is no evaluation of Noble's cartoons. Are all the films that Noble designed equally good? If not, which are the better ones and why? Where and when did Noble stumble? McKinnon is not an artist and not enough of an art critic to write about Noble's work with sufficient depth. I would recommend this book to those wanting to know more about Noble as a person and the conditions he worked under, but anyone interested in Noble's designs is better off looking at his cartoons. Here's an interesting site that specializes in title sequences for both animated and live action films and TV shows. 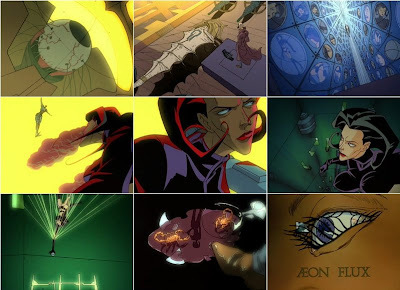 The animated films include The Incredibles, Kung Fu Panda, Aeon Flux (pictured above), Cowboy Bebop and Tekkonkinkreet. Live films include To Kill a Mockingbird, Casino Royale, Natural Born Killers, Vertigo, Iron Man, etc. There's lots more at the site, so if you have an interest in title design and the various ways titles are used (for backstory, for setting mood, etc.) it's worth a visit. One of the interesting things about the web is that you can track which sites visitors to your site have come from. The majority of visitors here either come from animation sites that I'm familiar with or from Google searches of various types. Occasionally, I discover an animation site that is new to me. Txesco is a Spanish animator who worked on the animation and direction of Pocoyo, a pre-school cgi series that is probably my favorite cgi ever done for television. I didn't know his involvement when I visited Txesco's site, but having seen his work, it makes total sense. What I first saw was this piece of musical animation. There's no word to describe it except charming. In many ways, it is dead simple. The design is spare but elegant. The music is public domain and the musical arrangement is anything but fancy. The movement is not overly complex, but it does everything that good animation is supposed to do. The shapes change. That's one of the most basic things required in animation, but it's regularly forgotten. There is beautiful contrast in the timing; slow movements are placed against faster movements. Most of all, it is playful; the character's attitudes, poses and motions are fun to watch. The movement itself is entertaining. 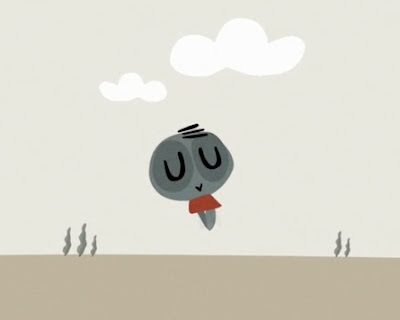 Here's some other animation by Txesco that is also fun. What I love about this work, and Pocoyo, is the back-to-basics approach. It is well designed, but the design doesn't overwhelm the motion as happens in so much TV work. The lack of dialogue prevents speech from being used as a crutch. This work relies on motion to entertain, and that is the heart of animation. So much animation, especially on TV, is dull and literal. It truly is what Chuck Jones labeled it decades ago: illustrated radio. It doesn't have to be that way and artists like Txesco prove it by showing us a better way to do things. "The main problem, as I see it, is that over seven years of development, there was a whole lot of money spent. I’d guess somewhere around half a million. In the end, there is just one eleven-minute pilot that is not aired. Consequently, the network is very, very cautious and slow with the production of each pilot. Also, the eleven minute pilot doesn’t really tell much more about the show than, say, an eleven minute animatic with one minute of animation that could be completed for one-tenth the cost." Amid Amidi of Cartoon Brew has an interview with Will and Fran Krause about their experiences pitching and producing a pilot for the Cartoon Network. As you can see from the above quote, the process went on for a very long time and cost a lot of money. In the end, the pilot didn't become a series. While everyone wants success, whether it's defined as money, popularity or quality, the hard truth is that most things fail. So long as the audience has choices, it will migrate to what it enjoys, and abandon everything else. While no one courts failure intentionally, it does have one undeniable benefit: it proves that something doesn't work. Both the Krause brothers and Cartoon Network learned this but at much too high a cost. The resources spent on the pilot could have used to make several pilots or a couple of half hour specials. The Krause brothers retain the rights to the characters, but there's a lien against them. Anyone interested in picking up these characters has to reimburse Cartoon Network for the money it has already spent. Therefore, the odds of this happening are low. This gets back to the idea of efficiency that I talked about here. In industry, where time is money, there is a benefit to rapid prototyping -- taking an idea and putting it into tangible form as quickly as possible. The next step is to test the prototype and see if it is viable. In other words, you want to fail quickly and cheaply. If the only benefit of a failure is to discover that an idea doesn't work, the less time and money you spend on a failure, the smaller your loss. Furthermore, the less you spend on one idea, the more money you have left to spend on another. Success is often a question of percentages. The more ideas you can afford to test, the more you learn and the more likely you are to finally succeed. Too many enterprises fail because they run out of money before they find an audience. The answer to all this is to fail faster and cheaper. Why do an 11 minute pilot? While that's the format that Cartoon Network ultimately wanted, why not do 30 second pilots and put them on the web? Far more ideas could be tested for the money spent on an 11 minute pilot and the network could have tangible feedback in terms of hits and comments from a real audience, not executives or focus groups. Once an idea showed promise, then money could be spent to expand it to an 11 minute pilot and the odds of success would be much greater. "Someone running a startup is always calculating in the back of their mind how much "runway" they have—how long they have till the money in the bank runs out and they either have to be profitable, raise more money, or go out of business. Once you cross the threshold of profitability, however low, your runway becomes infinite. It's a qualitative change, like the stars turning into lines and disappearing when the Enterprise accelerates to warp speed. Once you're profitable you don't need investors' money. And because Internet startups have become so cheap to run, the threshold of profitability can be trivially low. Which means many Internet startups don't need VC-scale investments anymore. For many startups, VC funding has, in the language of VCs, gone from a must-have to a nice-to-have." What Cartoon Network, and other big media companies, bring to the table is money. It used to be money and distribution, but now distribution is free thanks to the web. If artists can keep their costs low enough, they no longer need Cartoon Network for money plus they get to own their creations. Artists will still fail, but if they can fail faster and cheaper than media companies, they have better odds for success. There's an interesting article in the NY Times about how Wall Street is afraid that Pixar's next release, Up, will not meet their financial expectations. Disney, to it's credit, is defending the film's prospects. The article contains some interesting material on box office grosses and merchandising revenue. It appears that Up will be the last original Pixar feature for at least 3 years, with Toy Story 3 and Cars 2 in line as the next releases. I've been reading a lot of interesting books in the last year, all of them about the economic shift that's resulting from the web. This shift started before the economic downturn, but the downturn is accelerating it in various ways. For the record, the books include Crowdsourcing by Jeff Howe, Here Comes Everybody by Clay Shirky, The Wisdom of Crowds by James Surowiecki, Remix by Lawrence Lessig and What Would Google Do by Jeff Jarvis. All of these books are about aspects of the web that have fundamentally changed how the economy functions. The first three talk about how improved communication allow for people to organize themselves or find information in ways that were not efficient in the past. Remix is about how digital tools allow us to use existing media as raw material for new expressions. What Would Google Do examines Google's business model and seeks to apply it to other industries. Jeff Jarvis feels that we're not in a recession or depression so much as a fundamental restructuring. The problem with this kind of shift is that nobody knows where it's headed. Here's Clay Shirky from a fantastic essay on the what's happening in the newspaper business. According to Jeff Jarvis, one of the fundamental changes is that the old economy was about managing scarcity where the new economy is about managing abundance. Here's an example from before the web. Initially, there were three U.S. TV networks. If your company wanted to advertise a mass market product, you literally only had three places to go to reach large numbers of people. The networks could charge a premium because what they offered was scarce and the demand was high. While a network ad could reach 30 million viewers, it was highly inefficient in that there was no way to know how many of those viewers were actually in the market for the product. You could pay to reach 30 million, but maybe only one or two million would be interested. Once cable TV fragmented the audience into specialized niches, advertising migrated to cable because while the audience was smaller, it was more targeted. In order to reach the two million interested viewers, you might only have to pay to reach 5 million. What you get here is a lower cost and higher efficiency. The cost is lower because the resource is no longer as scarce. The web takes things even further. You can advertise on Google and tie your ad to a keyword search. Therefore, everyone who sees your ad is interested in your product because they're actively searching for information about your product category. And you can count click-throughs precisely. This has had a devastating effect on any media based on advertising. Newspapers and magazines are suffering because their revenues are dropping faster than their costs. They're trying to preserve inefficient models while customers and advertisers are voting with their browsers for something that works better for them. Efficiencies cut costs. They also eliminate jobs. When photocopying was used to transfer animators' drawings onto cels, inkers were eliminated. When scan and paint software became available, fewer painters were needed. When Flash or ToonBoom allowed for a library of assets that only needed to be coloured at the time of their creation, more painters lost their jobs as did inbetweeners and assistant animators. When this happens on a massive scale, as is happening now, it takes time for all these people to figure out how to earn a living. 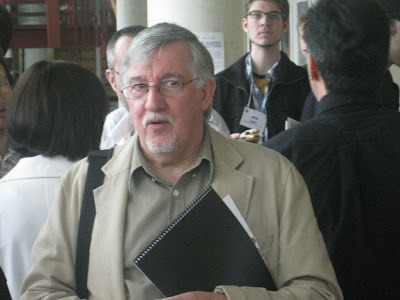 One of the aspects of the Google economy, according to Jeff Jarvis, is that in an abundance economy, you want to keep your profit margin as low as possible. Otherwise, you're inviting someone to undercut you. It also means that any efficiency you can imagine will eventually be put in place, by some other company if not by your own. Therefore, the companies that most rigorously pursue efficiencies are the ones that have a chance to survive. I think that this means flatter management structures and fewer middle men. In entertainment, this is a good thing as those in the middle add cost to a project and often slow down its production. It also might imply more outsourcing. I'm on record as being against this, but I'm not sure if outsourcing doesn't work because of the difference between entertainment and machine parts, or if it doesn't work due to the managerial structures of the old economy. There are unlimited opportunities for improved communication via the web. Would outsourcing work if was artist-to-artist as opposed to management-to-management? I don't know the answer to this. Those companies on the high end of animation are still in the business of managing scarcity. Whether it's feature films or big budget video games, they're protected temporarily by the difficulty in assembling the money, talent and technology to enter the field. I don't believe that we'll see new companies that are capable of competing against Pixar, DreamWorks, Electronic Arts, etc. However, the danger for these companies is not direct competition, it's the erosion of their audience. TV once again provides an example. Broadcast television used to be filled with ensemble dramas at 10 p.m. Shows like ER, Law and Order, St. Elsewhere, NYPD Blue, etc. were the standard and they took money and talent to produce. They were not destroyed by direct competition, but by the audience moving to cable. When the audience got smaller, the economics of those shows were no longer viable. What the broadcasters did was to clone the remaining successes, which is why there are so many versions of CSI right now. What the broadcasters were also forced to do was go to less expensive programming. That's why there are so many reality shows and Jay Leno is now at 10 p.m. I'm guessing that cloning is the final stage before collapse and movies and videogames are taking the same path right now. Everybody, including Pixar, is now producing sequels. That's certainly true of the videogame business. What's going to hurt these companies is the abundance of choice for the audience. It's going to steadily erode their bottom line until, like 10 p.m. dramas, the product will no longer be profitable. These companies may act like newspapers, trying to preserve the structure of their businesses more than understanding what their product really is. Jeff Jarvis and Clay Shirky have both pointed out that newspapers are in the news business, not the paper business. Printing and distribution are costs that the newspaper business can no longer afford and Jarvis and Shirky argue that newspapers should abandon paper altogether and put their remaining resources into re-inventing themselves online. I don't know what feature and gaming studios should be doing to reinvent themselves, but I worry that the economics of the blockbuster won't remain viable. Another thing that Jeff Jarvis points out is that the more control you can give to your customers, the happier they will be. Right now, Hulu is a website that makes TV shows available on demand. Another site called Boxee allowed Hulu's material to actually play on a TV. Hulu is now working to encrypt their videos so that Boxee can't use them, because Hulu's owners (Fox and NBC) are afraid of killing their broadcast earnings. This is what Jarvis refers to as the "cash cow in the coalmine." Hulu can't see that a screen is a screen is a screen. Trying to maintain a barrier between a TV screen and a computer screen is useless as the computer screen places more control in the customers' hands, which is why viewers are abandoning TV in the first place. Spending time and money to prevent people from watching your product on the screen of their choice is doomed to failure and a waste of resources. Similarly, restricting your online content based on geography in order to preserve existing distribution agreements is also problematic. Besides alienating the people who want to consume your content, you're creating a niche that pirates are happy to fill. This essay probably rambles more than my writing typically does (at least I hope my writing doesn't usually ramble), but it's a reflection of the chaos we're experiencing now. Nobody knows what's coming except for broad outlines: abundance instead of scarcity, greater user control, and closer relationships between companies and their customers. There is now literally more animation being produced than any person can consume. Between features, DVDs, TV, and videogames, you could literally spend all your waking hours consuming animation. With TVs, desktops, laptops, netbooks, and cellphones, there's no shortage of screens. Ultimately, animation is going to have to be produced as efficiently as possible and is going to have to find an audience that can be monetized somehow. Just like TV and newspapers are undergoing massive transitions, I think the same thing is going to happen in animation. We're not going to recognize the industry in five years. It hasn't been conceived yet and it won't be conceived by those people with a vested interest in the status quo. Something different is coming, but who knows what it will be?